Joey de Francesco famous organ and trumpet player. All photos: Ioana Taut. A black and white image! The Jazz Fest at night. From rain to sun by day. Taut and DeFrancesco after the interview. 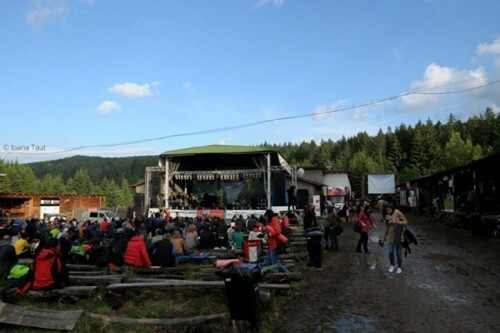 The 18th Edition of the Garana Jazz Festival just closed in the Western Carpathian Mountains, the largest outdoor JazzFest in Europe. More than 5000 people ventured again this year from afar during July 10-13 to Garana, where weather also plays a major role. 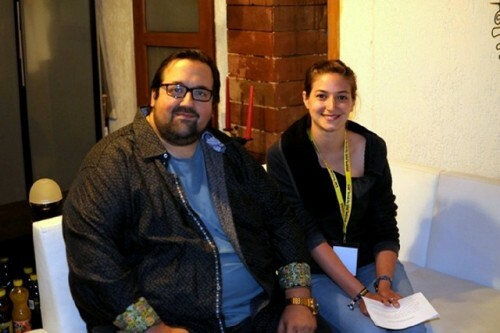 BFA’s young correspondent, Ioana Taut, currently living in Prague, interviewed two important musicians at the festival, Joey DeFrancesco and Kimmo Pohjonen. 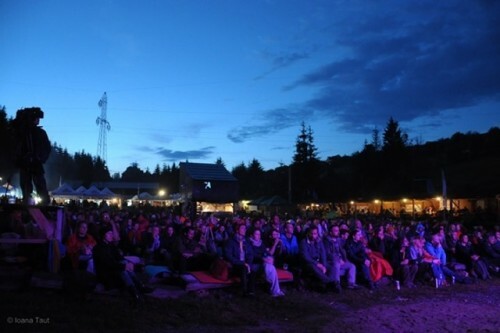 She also interviewed the director of Garana Jazz, who manages to bring together yearly a slew of Jazz Greats from throughout Europe and the USA. That interview will be published at a later date. 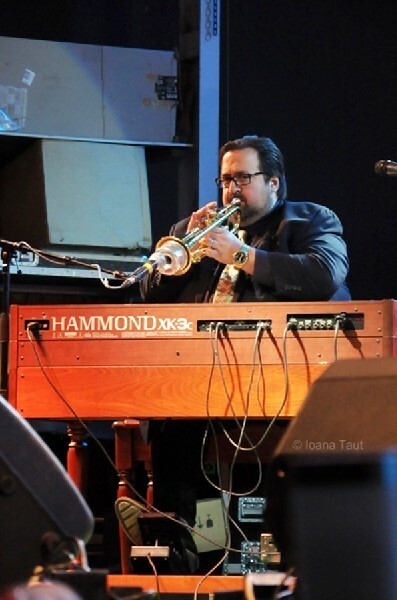 Joey DeFrancesco is a famous American organ player, trumpeter and vocalist. He started being interested in the organ when he was only four years old, marking what was the beginning of an exceptional musical career. So far, he has played with impressive jazz musicians such as Miles Davis, Jimmy Smith, John McLaughlin, Ray Charles and many others. His bibliography includes at least one album, each year and besides composing and touring, he is also involved in the creation of new Hammond organs. 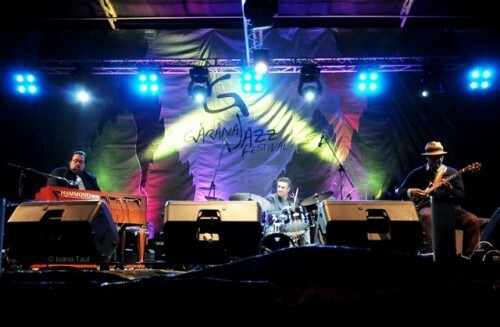 He was one of the highlights of the lineup of the greatest Romanian Jazz Festival, Garâna Jazz Festival, which reached its 18th edition! Ioana Taut: You are coming from a family with an impressive musical background that includes three generations of musicians. To what extent did this influence your decision in becoming a musician and how much of it was your own will? 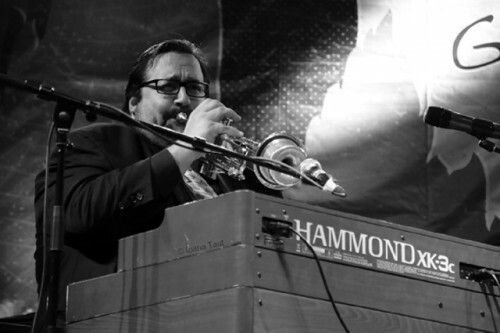 Joey DeFrancesco: I think I was going to become a musician no matter what, but lucky for me I was with a family of musicians. I really think I was going to be a musician. IT: What makes you think that? JDF: ‘Cause it was so natural and… I don't want to use the word "easy" and confuse people, because you have to work a lot, you have to practice, you have to play, but a lot of things came very natural, that I didn't have to work for it, as much as maybe other people do. So, I think, it was just something I was born with. IT: What fascinates you about the organ? JDF: I don't know, I still love it like the first day! It's just the sound of it, the way it feels it's just something very special and it’s organic! It’s electrical, but it's a certain physical natural element happening with it, that I still love. And I love the trumpet that way too! There are things you can't do on an organ that you can do on the trumpet - that's cool! The trumpet influences, it gives me other ideas for playing the organ. The organ is like an orchestra, almost. You have so many sounds, you can make it very loud, very sweet, very soft… there's a lot of dynamic range. IT: You started playing the organ when you were four years old. How can one comprehend music at that age? JDF: I think, you know, I come from a family of musicians, so I think that maybe it was in my blood, it was natural, because I started playing, as you said, very young, at four years old. It didn't take very long before I could really play. I knew how to play fast. I think it was a natural ability. IT: At that time, you were playing mostly Jimmy Smith songs. I know he was an important figure for you. Later on, you recorded the Legacy album featuring Jimmy Smith, which was also his last album. What was it about him that caught your attention? JDF: The sound of the recordings, the way he played just made me feel good. I wanted to try to play like that when I was young. It was amazing! Every organ player wants to do this. IT: You started having your own concerts at the age of 10, at 16 you signed your first contract with Columbia Records and at 17 you were touring with Miles Davis! Right after that you went out, bought a trumpet and started playing it! What was the musical chemistry between you and Miles? JDF: It was amazing! I was really honored and lucky to be able to play with Miles. He was very encouraging about everything and just to hear and watch him play on stage, night after night, I wanted to learn how to play the trumpet. So, when I came off from the tour, I thought: "I'm going to learn how to play the trumpet!” Then he found out that I was playing the trumpet and I played for him and he liked the way I played. He thought I sounded like him and he gave me a mouth piece, some mutes and things like that. So that's why I continued to play. IT: How did you experience the growth from being a young, talented musician to actually becoming the experienced, educated artist you are today? JDF: I think it just happens naturally. You don't really think about it, because you're trying all the time and you love music… so, things are going to progress in a natural way and you mature naturally, if you are serious about music and you are around a lot of good musicians. So, I think, it’s a natural process that you don't really know it's happening. But now, at this point in my life, I could tell the difference. If I hear a recording or something of me when I was younger, I know I've come to a maturity level… and it keeps getting better and better. I'm still pretty young; I'm 43, so I'm not an old man yet! (Laughing). IT: What was the most crucial moment in your career? JDF: I am a musician, so the most important for me is the music. The business side can be very frustrating sometimes and that can lead to a lot of people not wanting to do this. So I just focus so much on my love for the music that I get through all that. IT: Did you ever have a moment of doubt when you thought like:" Man, this is hard!?" JDF: I don't really know, it's hard to answer… Traveling is hard! I mean, for example, yesterday we had to take three airplanes to come here and then drive for three hours. Tonight, after the gig, I leave at one o'clock in the morning and drive four hours to Timisoara. So, the most difficult and challenging is the travel. But in the end, if you have a great concert and there are great people and they love the music, you forget all of this! IT: Can you think of something else you would have liked to do in life, if you wouldn’t have been a musician? JDF: Yeah, maybe I would drive race cars. I like to drive, I love cars and I love racing, so maybe that. I like electronics too; I like to build musical instruments… It would be something involved with musical instruments as well, I think, even if it's just building them. IT: Until now you have played with so many wonderful musicians - Miles, John McLaughlin, Ray Charles, John Scofield and many others. Is somebody out there you haven’t played with yet and would very much like to? IT: Can you see one of this collaboration happening in the near future? JDF: I don't know, you never know! IT: In the last twenty five years you released at least one album every year – except for 1997. How do you do that? JDF: You just do it! It's easy, music is easy! That part is easy! It's just getting there and do it. TI: Are you ever taking a break? JDF: Once in a while, yeah… from time to time I have a little time for myself and for my family. IT: What are your goals nowadays, after accomplishing so much? JDF: Well, moving forward. I know that there's a lot of organ players now that follow my direction, so that's nice, to have the younger generation follow what you are doing. So, I have a responsibility to keep me on the cutting edge… so that's my goal! IT: How do you like the venue tonight? JDF: I think it's great! It's very, very neat, a cool place! I hope the rain stops, it looks like the sun is coming out… it’s very nice, beautiful!